Visit West Metro Mommy for more Saturday Snapshots–and have a great weekend! Eeeee! What a gorgeous scarf! Congratulations on finishing the project! ❤ And that is a great way to show just how long the scarf is too. I knew it was long, but this really drives home how long. Congratulations on finishing it. It looks great. He was my doctor growing up, although I think I liked Jon Pertwee best really. That’s an amazing scarf and quite an accomplishment! I hope you’ll model it in another photo. It’s so big — I’m surprised it doesn’t swallow you. He was the best Dr. Who ever! (at least in our house) Your scarf is great. 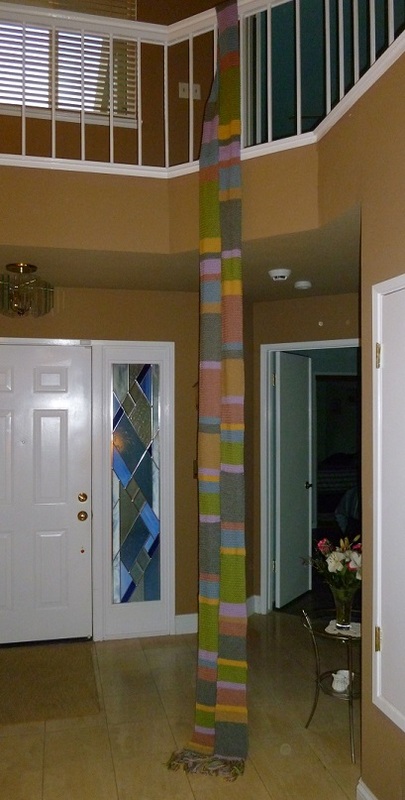 That is an amazing scarf – and quite a project to complete. How often did you knit? Daily? It took some real dedication to finish that project!